Leadership is implemented at all levels in the PLAN as a shared responsibility through the CCP Party committee system. In general, every headquarters organization in the PLAN down to the company level has a commander and a co-equal political officer. The commander and political officer, along with the deputy commanders, deputy political officers, and the directors of the four departments (Headquarters, Political, Logistics, and Equipment), compose the Party committee's standing committee, where all major decisions are discussed and decided upon for implementation. The political officer usually serves as the Party secretary and the commander as the deputy secretary. 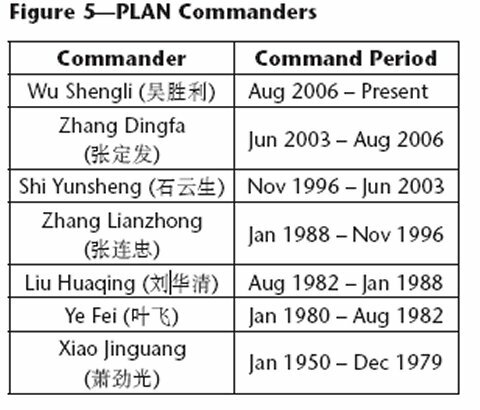 In September 2004, the commander of the PLAN, Admiral Zhang Dingfa, became the first PLAN commander ever to serve concurrently as a member of the CCP Central Committee's Military Commission (CMC). His promotion and appointment to the CMC provided a unique challenge for the PLAN within the PLA hierarchy. All organizations within the PLA are assigned one of 15 grades. In addition, the commander and political officer are assigned the same grade. However, when Zhang Dingfa was promoted one grade as a CMC member, neither the grade for the PLAN as an organization nor the grade of the PLAN political commissar was raised to the same level. Therefore, although Zhang and his successors will hold the same grade as the Chief of the General Staff and the directors of the General Political Department (GPD), General Logistics Department (GLD), and General Equipment Department (GED), the PLAN as an organization is not equal to the four General Departments and is still at the same grade as the seven Military Regions. 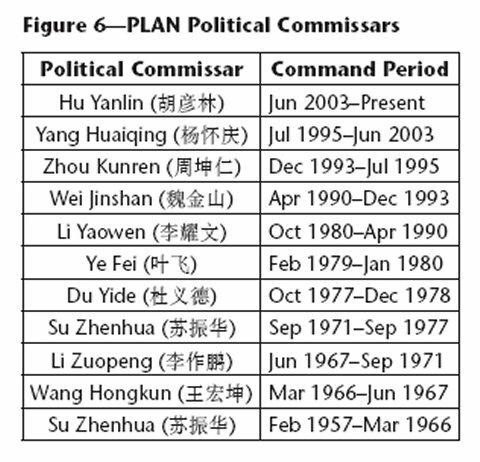 From 1949 to 2006, the PLAN has had a total of 7 commanders and 11 political commissars, as shown in the charts below. Since 1949, the PLAN has had about 40 deputy commanders, with an average of three serving at the same time. Each deputy has his own broad portfolio of responsibilities that cut across the four major departments. Whereas many of the early deputies were transferred from Army positions, almost all the deputies from the 1970s on rose up through the PLAN. Of the deputy commanders, 12 previously served as fleet commanders (2 NSF, 3 ESF, and 7 SSF) and 7 served as PLAN Headquarters chiefs of staff (i.e., director of the Headquarters Department). The remaining 19 deputies came from a wide variety of positions in the four major departments within PLAN Headquarters. Of the deputies, three were later promoted as the plan commander. Since 1949, the PLAN has also had about 25 deputy political commissars, with an average of two serving at the same time. Of the deputies, 10 previously served as fleet political commissars (3 NSF, 2 ESF, and 5 SSF) and 5 served as the director of the Political Department in PLAN Headquarters. The remaining deputies came from a wide variety of political positions within the PLAN, Army, and four General Departments. Six of the deputy political commissars have been promoted as the PLAN political commissar. Since 1949, the PLAN has had at least 14 chiefs of staff, who serve as the director of the Headquarters Department within PLAN Headquarters. Of these, 7 have received lateral promotions in grade as a deputy commander. Since 1949, the PLAN has had at least 15 directors of the Political Department within PLAN Headquarters. Of these, 5 have received lateral promotions in grade as a deputy political commissar. Each of the PLAN's three fleets has a commander and political commissar, who hold the same grade as the deputy commanders, deputy political commissars, chief of staff and Political Department director at PLAN Headquarters. 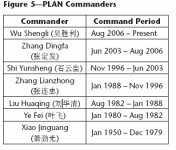 Since the late 1980s, the NSF, ESF, and SSF fleet commanders have also been concurrently appointed as a deputy commander of the Jinan, Nanjing, and Guangzhou Military Regions, respectively. Since the three fleets were established, the NSF has had 11 commanders and 11 political commissars, the ESF has had 11 commanders and 13 political commissars, and the SSF has had 14 commanders and 12 political commissars. 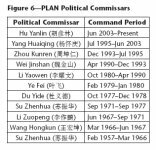 Of these, only the former commander of the NSF, Zhang Dingfa, and the commander of the SSF, Wu Shengli, have become the PLAN commander. In addition, only one fleet political commissar, Zhou Kunren, who served as the SSF political commissar, has become the PLAN political commissar.